Editor's note: This story is the final part of Southwest Michigan Second Wave's On the Ground Edison series. The project continues in August with stories on Kalamazoo's Northside neighborhood. When On the Ground first moved into Edison in April, the black and white portraits that line buildings on and near Washington Square revealed a diverse neighborhood. Their smiling, open faces seemed to say, We’re here. We want you to know us. As the week and months progressed, I could identify more and more of the faces, such as Helen Van Loo, Gerry Hoffmann, and Adrian Vazquez. I even recognized a few people at the Washington Square Art Hop, though I didn’t get to know them all by name. The Inside Out We are Edison Project, spearheaded by Anna Roeder, Administrative Assistant at the Kalamazoo County Land Bank, was a place-based public art project grand in scope. Inspired by a global Inside Out Project conceived of by TED Prize Winner JR, the 112 Edison portraits featured people of all ages and ethnicities and were taken during three Edison events—one at El Concilio (formerly the Hispanic American Council), at Washington Square Co-op Apartments, and at a Washington Square Art Hop. JR’s "call to communities across the world to participate really struck a chord and resonated with the goal of uniting neighborhood residents with art," says Roeder. "The Inside Out Program was a huge success for Edison," says Tammy Taylor, Executive Director of the Edison Neighborhood Association. "People are still talking about it and Facebook post sharing it even today." The project’s photographer, Fran Dwight, an Edison resident since 1994, subsequently became the On the Ground Edison photographer during our four months of neighborhood coverage. Team photographer was, she says, a position she easily adapted to, in part, from having connected with neighbors during Inside Out. "Inside Out was really good for me because I tend to live in my own little world in my own little house. Not that I don’t like my neighbors, but I’m an introvert," she says. "But that opened the door to a 100 families for me. I see some of them now and we say 'hi.'" While Fran says the unveiling at the 2017 August Washington Square Art Hop was disappointing due to torrential rains, but the colorful umbrellas and people who did attend provided a wonderful contrast in the photos Fran took of the event. "Everyone was floored by the project," she says. "It was just amazing." 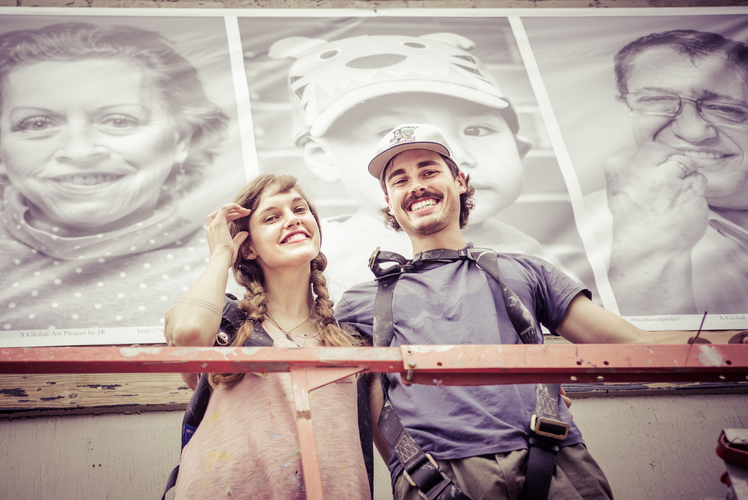 "The process of taking and installing these portraits created a lot of positive energy in the community," says Roeder. "It featured individuals from all different walks of life, side by side. People exuded a sense of pride in seeing their larger than life image displayed in a prominent public place." In addition to taking the portraits for the project, Fran also set up two-minute photo sessions in which she took family portraits free of charge. "It really made me feel a part of the neighborhood in a way that I hadn’t before," Fran says. "As that project developed, I felt a grander and grander sense of being a part of my neighborhood. I was proud." 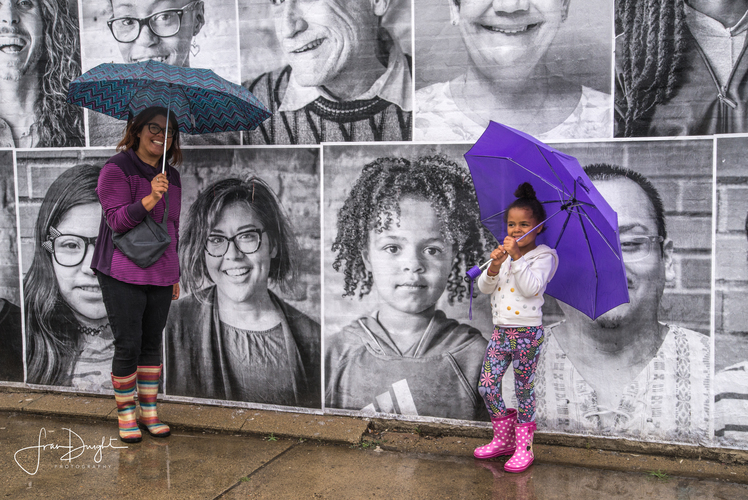 Fran Dwight's captured humanity and joy in the portraits she made for the Inside Out project in the Edison neighborhood. Photo by Fran DwightWhen I ask Fran how she was able to capture so much humanity and joy in her photos, she says, "It’s because I’m looking for more than a picture. I’m looking for a feeling. And when I see it, that’s when I know I got the picture." Her ability to see and capture that moment on film has added warmth and depth to our Edison coverage. Now that Inside Out We are Edison is almost a year old, many of the faces on the buildings are deteriorating, paper peeling at the edges. A few are decorated with graffiti. The wheat paste that once adhered the faces to the cement and brick has started to wash out--all except for a line of portraits at the top on Portage that were laminated in vinyl. "I feel like it’s doing exactly what it’s supposed to do. I don’t feel sad," Fran says of the weathering. "I don’t feel a sense of loss. There’s going to be a next stage of the neighborhood. They’ll clean it off, and they’ll move on." When out and about in Edison, Fran is still running into residents that she wishes she had photographed for Inside Out, and likewise, after four months of On the Ground Edison, I am still learning about new Edison stories I’d love to cover. The four stories published in July by our Edison community contributors, trained and guided by On the Ground Managing Editor Kathy Jennings, allowed me to step back and see Edison from their eyes, too—and the picture is rich and complex. I want to know more. Luckily, the contributors have indicated they want to keep writing about their neighborhood. "The On The Ground program has made a huge positive difference in how people are viewing the Edison neighborhood," Taylor says. "I’ve been approached and called by several people in the neighborhood and outside of the neighborhood who’ve commented on how much better and safer the Edison neighborhood is now versus in the past." Roeder agrees. "On the Ground has been an amazing mechanism for uplifting and bringing to light the many positive stories and projects that are happening in Edison. It has been an honor to be involved with this work of positive journalism." During our Edison coverage, our team’s opportunities for connection and engagement have been plenty. For example, in an On the Ground sponsored project, fourth graders in Aaron Mason’s class at Washington Writers’ Academy wrote individual and collaborative poems about their neighborhood. The poems were then displayed with their artwork during the June Washington Square Art Hop. On the Ground Engagement Editor Vicky Kettner, chose the apt slogan, Our stories, Our neighborhood, which was printed on T-shirts that were handed out to residents and art hop attendees. Our neighborhood is where we live. Our stories follow us everywhere. And in a mid-size city like Kalamazoo, that means those stories often intersect and overlap, much more than we can probably ever know. For those who have been following On the Ground, these stories of Edison have hopefully made the neighborhood a little larger, and a little smaller at the same time. Next neighborhood, Northside. Keep reading. Southwest Michigan Second Wave’s “On the Ground Edison” series amplifies the voices of Edison Neighborhood residents. Over three months, Second Wave journalists have been imbedded in the Edison Neighborhood to explore topics of importance to residents, business owners, and other members of the community. To reach the editor of this series, Theresa Coty-O’Neil, please email her here or contact Second Wave managing editor Kathy Jennings here.